With tomatoes, there’s very dramatic difference between homegrown and store-bought. Vegetable warehouses can stock up on green tomatoes because tomatoes can turn red while still hard and filled with starch if they’re exposed to a gaseous plant hormone, and when it comes time to sell them, the warehouses simply turn their tomatoes red. Add to that the stores’ preferences for tomatoes that store well, don’t bruise, and as a result don’t get too soft or sweet – tomatoes turn hard starches into sugars— and the hard, bland winter tomato is not a big surprise. Compare those to tomatoes ripened on the vine, which actually do fully ripen in all respects while sitting in the sun, and it’s hardly the same thing anymore. Growing your own tomatoes is easy, but you need some sun, some fertilizer, enough time to water and tie up your plants, and to be around when the tomatoes ripen. All of these things are fun to do, however, and whenever you rustle your tomato plant, you’ll even start smelling like tomatoes as well. To grow tomatoes, start from seed or buy a grown plant. Seeds are easy to sprout, but also easy to kill—if you aren’t very diligent about watering, they are likely to shrivel up and die. Because it is May and so warm in Oxford, Ohio, you can keep your seeds outside from the start. Buy seeds online or scour the seed rack in a store, and get those seeds sown ASAP. You can also buy a grown plant. Grown plants are easier to care for and closer to bearing, and many wonderful varieties are sold. Do not buy tomato plants at big name retailers: I made that mistake last year, and those tomatoes were just not tasty. Plenty of vendors sell tomatoes at the Oxford Farmer Market Uptown, every Saturday morning from 8:00-12:00. Stony Hedgerow Farms is my tomato vendor of choice, with 33 varieties, they helped me pick out the best tomato plants for my situation when I asked for an early-bearing, sweet variety. If you buy a tomato from Stony Hedgerow Farm, or any other vendor that sells tomatoes in paper cups, planting is easier than you may think. You keep the tomato in the cup, dig a hole in your garden (or container), and lay the cup horizontally in the hole after putting a bit of fertilizer or compost into the hole. Then, you cover up the tomato cup, sprinkle some more fertilizer, and water well. Your plant will stop lying on the ground and start growing upwards within a day or two. 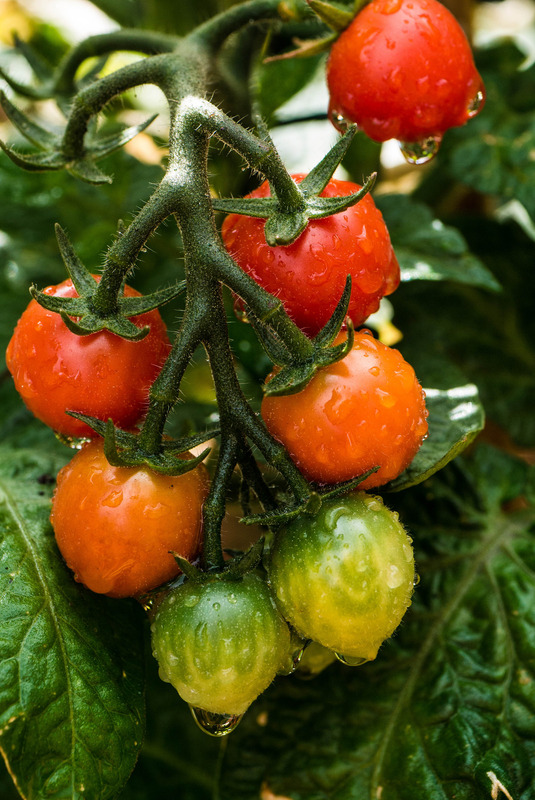 Tomatoes love a lot of sun, water, and fertilizer, because they produce such large fruit. Consider tomatoes for yourself, or anyone who loves to garden. A potted tomato plant makes a wonderful gift. Take a study break to obtain a tomato!